“Christmas Is For Sharing” is the 2014 Christmas advert from the Sainsburys store in the UK. It commemorates an extraordinary event which took place during the First World War one hundred years ago: the Christmas Truce. On Christmas Day 1914, the opposing troops laid down their arms, crossed “no-man’s land”, shared some food and played a game of football. This video is a song written by Paul Mc Cartney, one of the Beatles. It tells the true story of Christmas Day 1914 when the British and German troops lay down their weapons for the day, shared some food and played a game of football together. This could be used as a great introduction about war and conflict, especially at this time of year. It could also be used as a starting point for some creative writing. 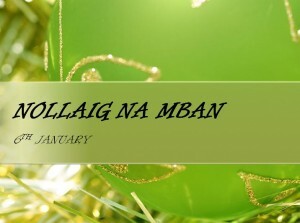 This short video explains how Christmas has come to be celebrated on December 25th, principally as it was near the winter solstice. 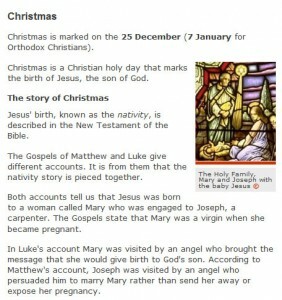 This short video shows how the celebration of Christmas has evolved over the centuries and how Christmas was even banned at some stages throughout history. 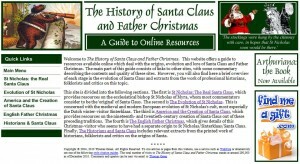 This website offers a guide to resources available online which deal with the origins, evolution and lore of Santa Claus and Father Christmas. The main part consists of links to other sites, with some commentary describing the contents and quality of these sites. However, you will also find a brief overview of each stage in the evolution of Santa Claus and extracts from the work of professional historians, folklorists and critics on this topic. 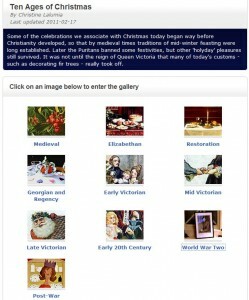 This website from the BBC gives information on how Christmas was celebrated in ten different eras throughout history including Medieval, Victorian, during World War II and the post-War period.